FOX News - A painting that features President Obama posed as Jesus Christ crucified on a cross is on display at a community college art gallery in Boston. The painting by Michael D'Antuono is part of a larger exhibit called "Artists on the Stump – the Road to the White House 2012." It's on display at the Bunker Hill Community College Art Gallery until Dec. 15th. 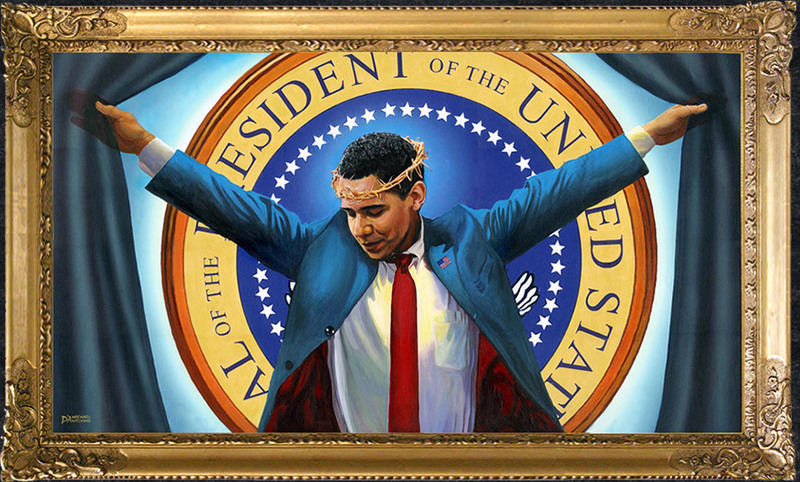 The painting is called "Truth" – and shows the president on the cross with his arms outstretched. A crown of thorns rests on his head. The link to this story is getting a lot of comments over on the Fox25News Facebook Page. This painting was inspired by watching conflicting reports on the same issues on the different cable newscasts and the effect on their viewers. Peoples' perceptions of the issues seem to get distorted though their political lenses. People have had drastically different interpretations from this painting. What you see in this painting will be a reflection of your own partisan view and that is precisely the point.